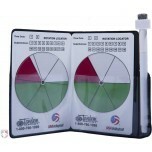 Find below the offical USA Volleyball licensed dual location rotator. I give this indicator 4 out of 5 stars. It's helpful but the dry-erase marker is kind of useless as it dries out rapidly and writes with a thick line. I prefer a finer point so I replaced the marker with a fine-tipped Sharpie of my own, and the results are great. When using this indicator, I've received comments from others about how professional this is. Recommended!